Join an exclusive list of serious slots and casino players who get the latest online casino news and big jackpot slots updates each week. You won't want to miss out. Already taking advantage of our casino newsletter? Take a look at some of the biggest jackpot slots online. With millions in prize money to win there's no better type of video slot to play. Or if you are looking for a new casino site that's safe with plenty of offers and will treat you right take a look at our exclusive list of the best casinos online and mobile. There's something here for everyone, so sign up and become a Sumosapien today. You’re probably thinking what is a Sumosapien and do I want to become one? What will it give me and what can I get from it? Read on to sign up and find out. Let’s tell you why joining our elite casino news list is good for you. 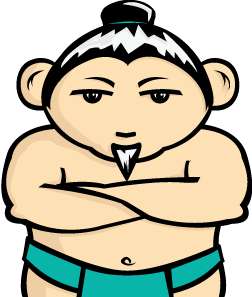 A Sumosapien is someone just like you who reads our content, signs up for free to receive casino bonuses and new slots news in their emails and keeps coming back for more. Someone who is never satisfied with below standard service from casinos and who wants to be treated as a VIP by only the best. Do you fit this criteria? Think you are worthy of receiving Sumo Sid’s news? If you are sign up now for free to our newsletter and become part of the SlotSumo elite.